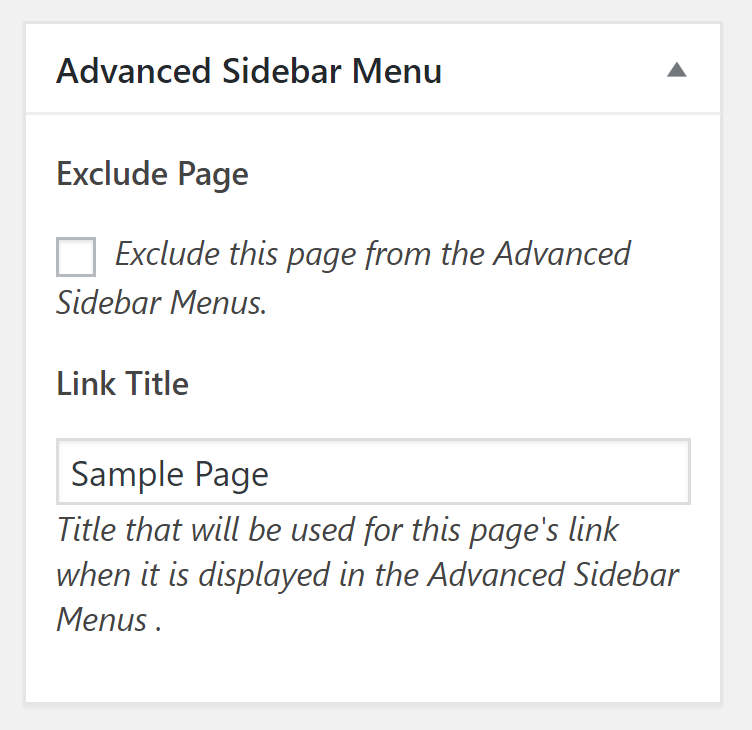 Advanced Sidebar Menu PRO makes managing your menus fully automatic. With just enough options to get the job done, this WordPress plugin is extremely lightweight and easy to use. 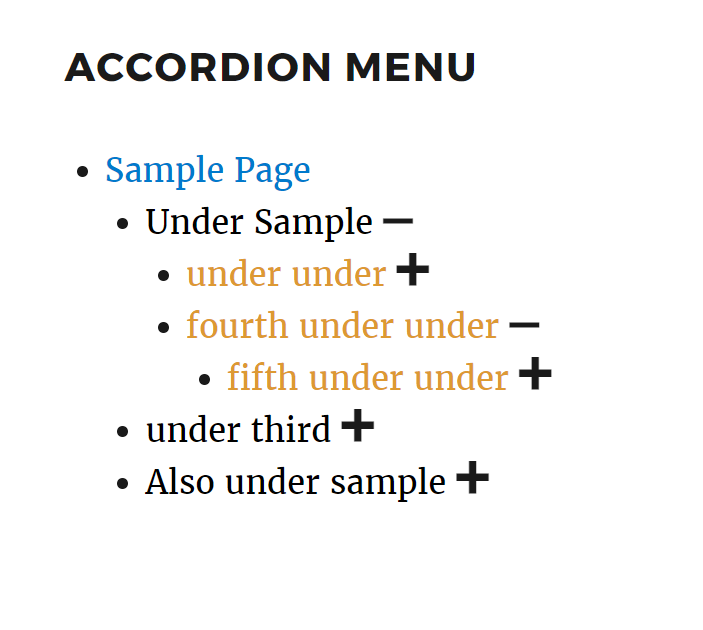 Accordion Menus take your menus to the next level by giving your users the ability to open and close sections of your menu. You can choose to keep all your menus closed until a user clicks an icon or just leave the top levels open. Choose the icon style and color that matches your site and you’re ready to go. 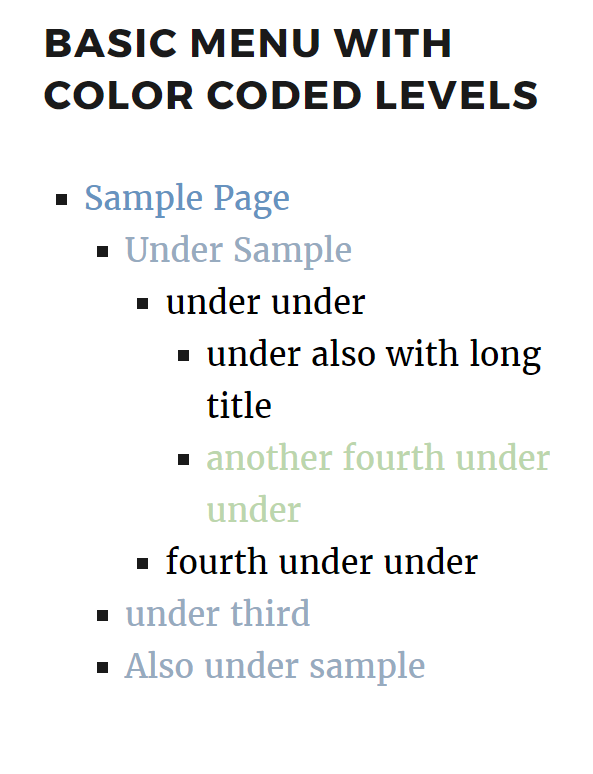 Give your menus some style to dress them up to match your site. You can choose different styles for different levels on your menu. 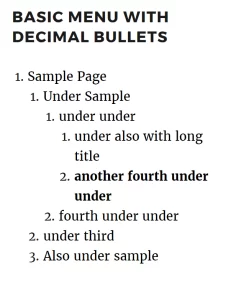 You can select a bullet style for your menu with seven styles to choose from, or select none to show no bullets. You can even style the current item or parent of the current item separately. Intuitive color pickers make choosing colors easy. Be sure to try out the “block styling” option. 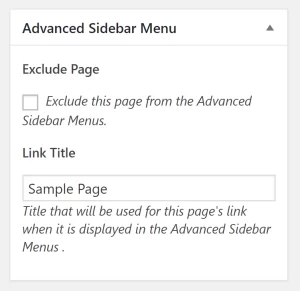 Turn your custom menus into sidebar menus by using the Advanced Sidebar Navigation Menu widget. Any menu created within Appearance -> Menus may be used with this widget! 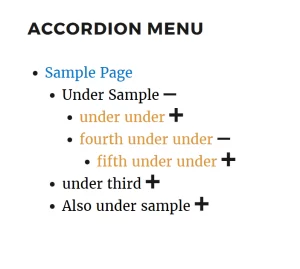 Want to add some styles or maybe an accordion? No problem, this widget supports all style and accordion options, as well as options to display the current items only. Ever wanted to change the text displayed in the menu? Now you can! 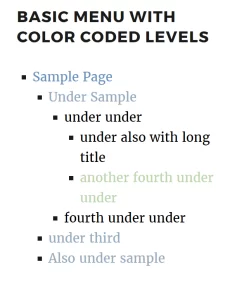 This plugin creates simple options available on every page which let you customize how it is handled. Changing the text is as easy as entering it into a field. 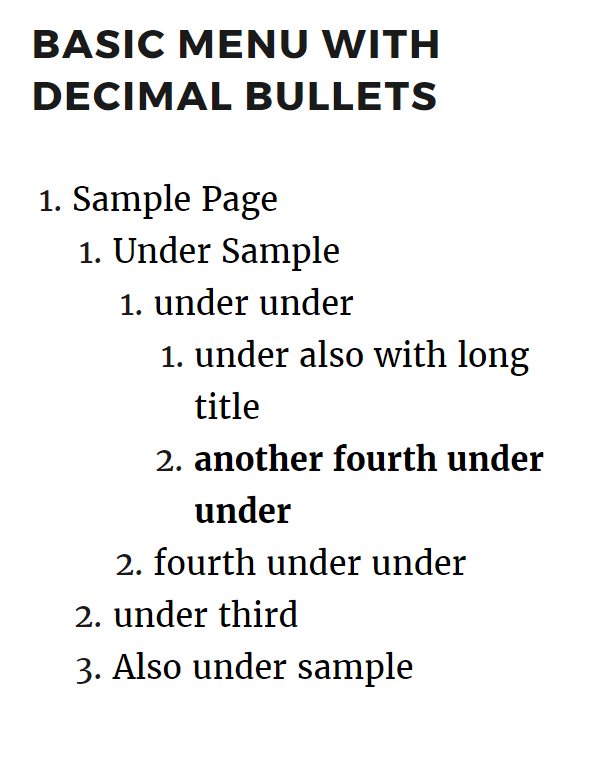 Excluding a page from all menus is done with single click checkbox. 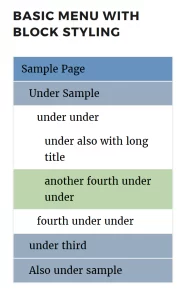 Optionally display child page siblings when on a child page. With our without grandchildren available. Very useful and easy to use. When I ran into an issue this week, the plugin author looked at my site individually and updated the plugin to solve the issue. Couldn’t be happier. I submitted a request for beaver builder support and within 2 days Matt added it. Brilliant plugin, the pro version did exactly what i wanted and after needing some tweaking to the functionality Mat helped me with some additional code to do what i wanted. Great plugin and support is second to none.. thanks again Mat!!! I needed to create a sidebar menu for a client of ours that matched the footer navigation. This plugin did just what I needed. Our organization is working to convert 3 support documents from InDesign > PDF to WordPress. Each of these documents include at least 60 pages. 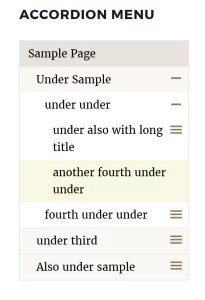 Converting the pages has been hours of work but building a sidebar TOC was a SNAP with Mat’s Advanced Sidebar Menu (and we got the PRO version)! And, he answered a support question super-quick. Thank you, Mat! YOU ABSOLUTELY ROCK! This is exactly what I need. Mat good sir, you’re a God send. All the 5 star reviews for you! Version 3.1 makes me happy! I use this plugin on all sites I design. I could always make the menu do what I want with filters, now I click checkboxes. Thanks again for the years of great support! Many thanks Mat. Excellent service. Blown away by the level of support. I have never seen support this thorough and prompt. Using this plugin on every site I make. All listed features work fine. I would have liked the plugin to use WordPress Menus instead of automatically generating menus. I’m sorry to hear the plugin does not have all the desired functionality. 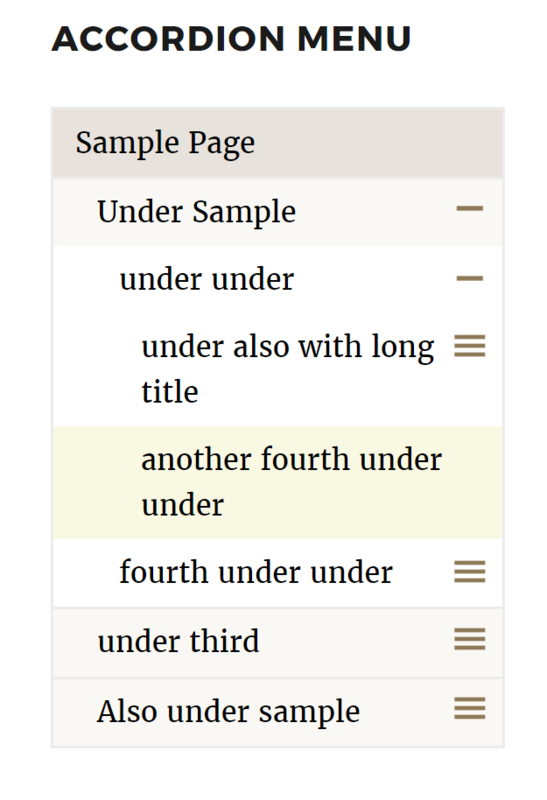 WordPress has a widget built in called “Navigation Menu” which allows you to use a WordPress menu as a widget. As a pro customer you automatically have priority support available. Please reach out to me via the contact form and allow me to help you style the Navigation Menu widget. I wanted to stop in to let you know that the PRO version now supports WordPress Menus. So many choices I thought, is this plugin going to make me coffee as well? I am not a nerd and was worried I would not know how to use the choices. I used the customizer to try out the widget choices. Uber easy to understand, I figured it all out easy. 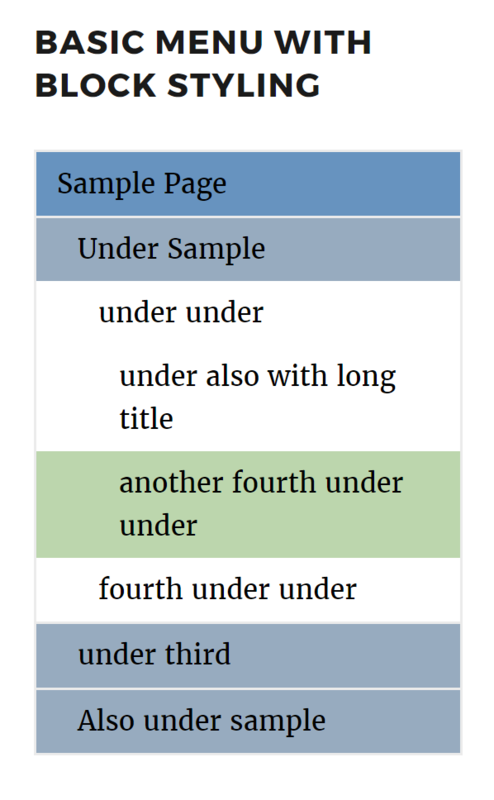 I use this for WooCommerce categories! Fantastic!